Drawing on the writings of German pastor-theologian Dietrich Bonhoeffer, Jennifer M. McBride constructs a groundbreaking theology of public witness for Protestant church communities in the United States. In contrast to the triumphal manner in which many Protestants have engaged the public sphere, The Church for the World shows how the church can offer a nontriumphal witness to the lordship of Christ through repentant activity in public life. After investigating current Christian conceptions of witness in the United States, McBride offers a new theology for repentance as public witness, based on Bonhoeffer's thought concerning Christ, the world, and the church. McBride takes up Bonhoeffer's proposal that repentance may be reinterpreted "non-religiously," expanding and challenging common understandings of the concept. Finally, she examines two church communities that exemplify ecclesial commitments and practices rooted in confession of sin and repentance. Through these communities she demonstrates that confession and repentance may be embodied in various ways yet also discerns distinguishing characteristics of a redemptive public witness. 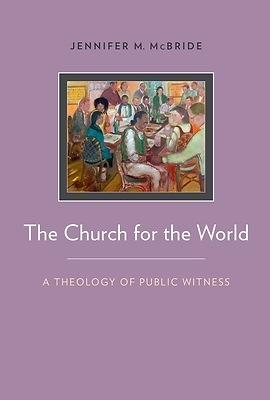 The Church for the World offers important insights about Christian particularity and public engagement in a pluralistic society as it provides a theological foundation for public witness that is simultaneously bold and humble: when its mode of being in the world is confession of sin unto repentance, the church demonstrates Christ's redemptive work and becomes a vehicle of concrete redemption.